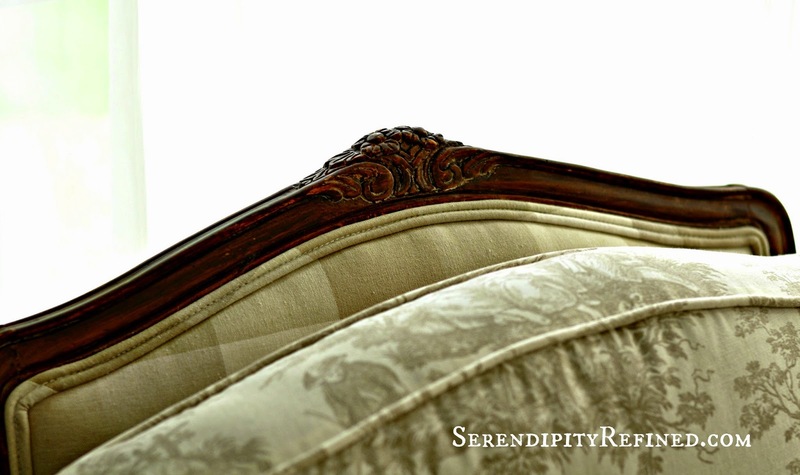 This is the result of the fact that one dreary day spring of 2013, I casually mentioned that I needed a couple more French Bergere chairs. Yes, I used the word, "needed". Don't judge me, I have a "thing" for French chairs...and ironstone...and roadside rescue furniture...but I digress. 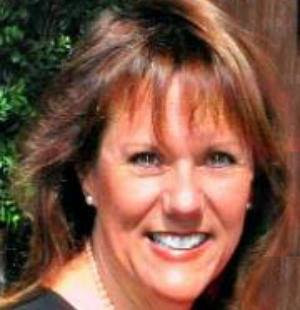 Within 12 hours, Ann sent me a link to a Craigslist ad for two chairs that were $40 apiece. Of course, they're not real French Bergere chairs but they're wide...and sturdy enough to hold a six foot two inch tall, 22 year old, which makes them infinitely less scary to the male populous of my home and far more likely to be accepted as real furniture (regardless of the fact that they have curvy legs and little pads on the arms). The upholstery was in really great shape but the woman who owned the chairs had cats. Cats which my youngest is horrifyingly allergic to in that "special" way that makes his eyes swell shut when he's around them. Even a good cleaning would have still put him at risk for having an allergic reaction so reupholstering was a necessity. The wood had a sprayed on pecan finish which over the years I've come to know and love accept but I still don't completely understand. 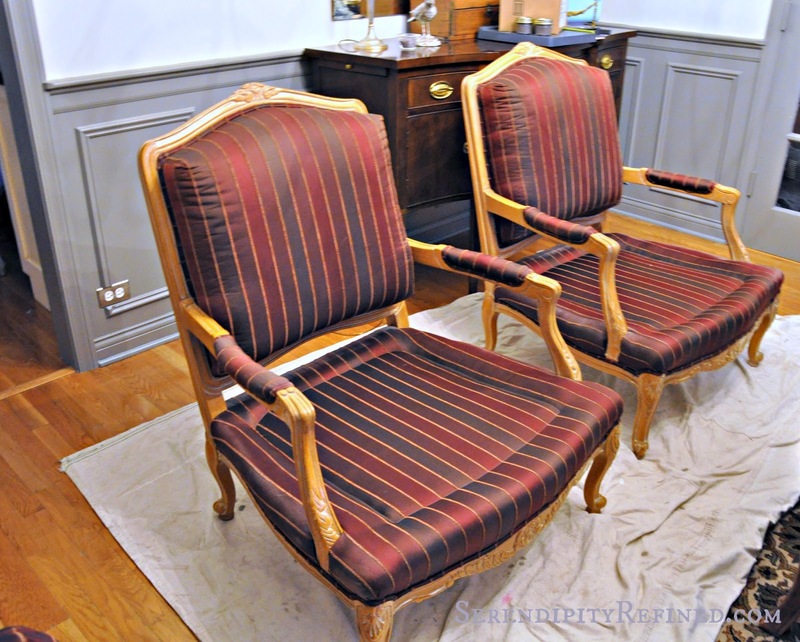 The first thing that I did was to remove the fabric welting and lightly sand the chairs with a sanding sponge. I can't say this enough: no matter what the paint says, I ALWAYS sand before painting! I'll admit that I don't always do it thoroughly, but I do sand. Regardless of what the product states, a little sanding before painting will yield a nicer finish. Sanding helps paint to adhere to previously finished wood and removes imperfections on new wood. 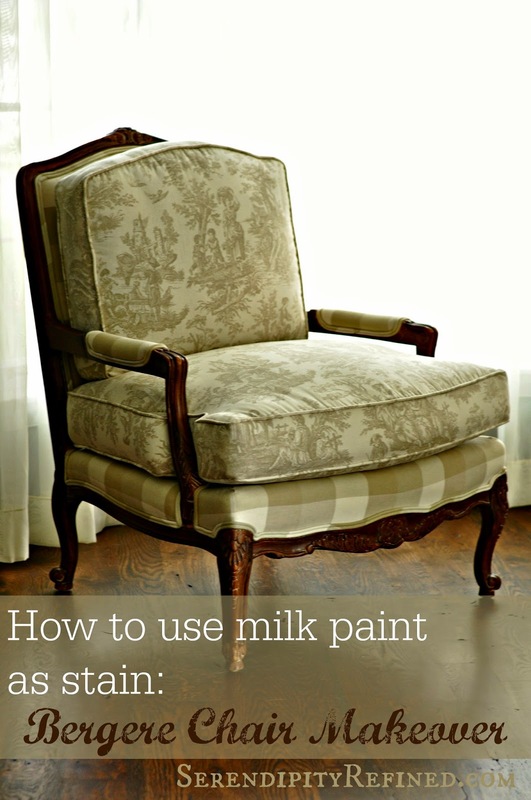 Next, I stained the chairs using Miss Mustard Seed Milk Paint (Curio). First, I mixed 1/4 cup of paint powder with 1/2 cup of water then, after the paint was mixed, I added 1/4 cup of bonding agent. The mixture is very thin and I only used a total of one cup of stain to finish both chairs I decided to stain rather than paint the wood because I wanted the grain and the texture of the original finish to show through but I wanted to change the color. Once the milk paint "stain" was dry, I went over the chairs lightly with 0000 steel wool to remove any rough spots. 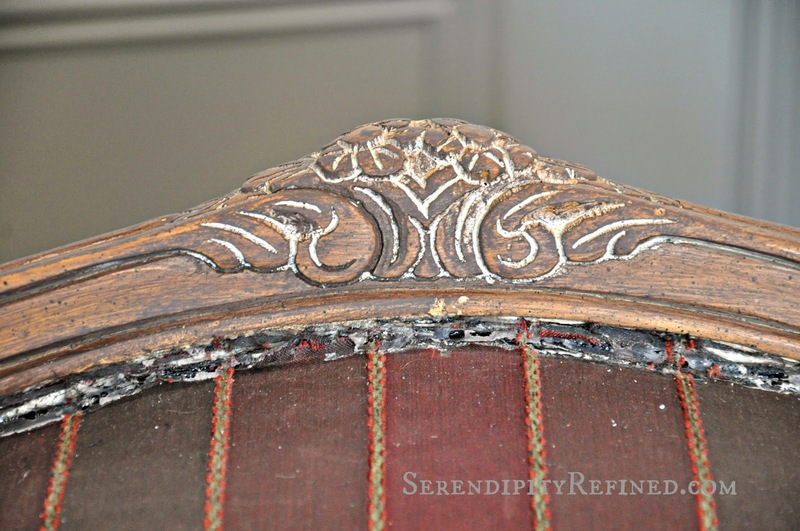 Then, I brushed MMS white wax into the carved portions of the pieces and finished the rest of the chair with dark wax. I waited another 24 hours and gave them a second coat of clear wax. 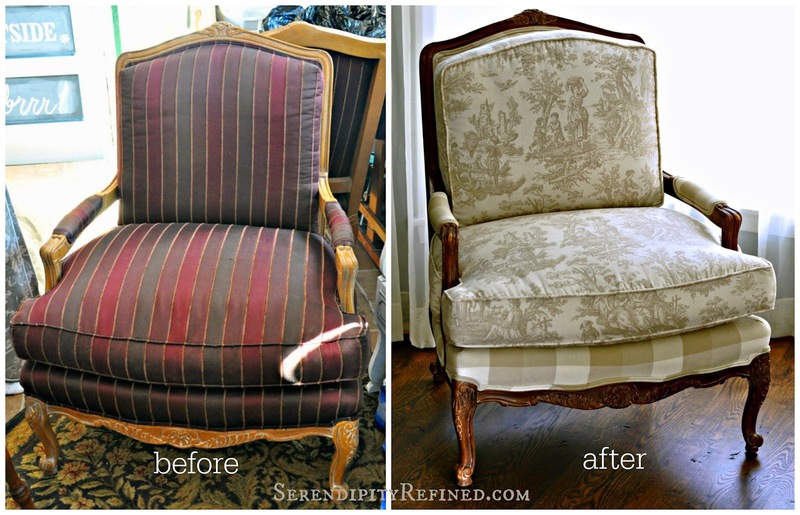 After an 8 week wait for back ordered fabric, the chairs went to my friend, Jami for reupholstery. Yes, You read that correctly, I sent them out. 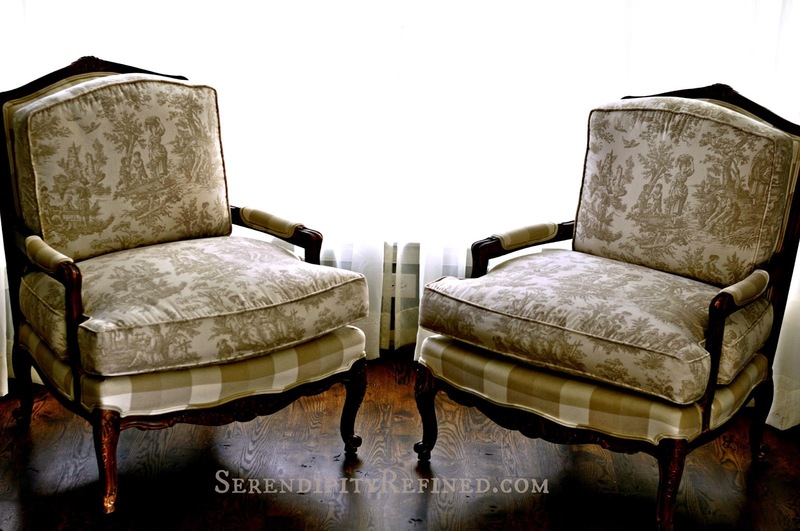 Between my full time job and working on the apartment rehab as well as the farmhouse rehab, I decided that I'd pass on adding reupholstering two chairs to my growing to do list and I called in the pro's. I decided to have the back cushion made "loose". 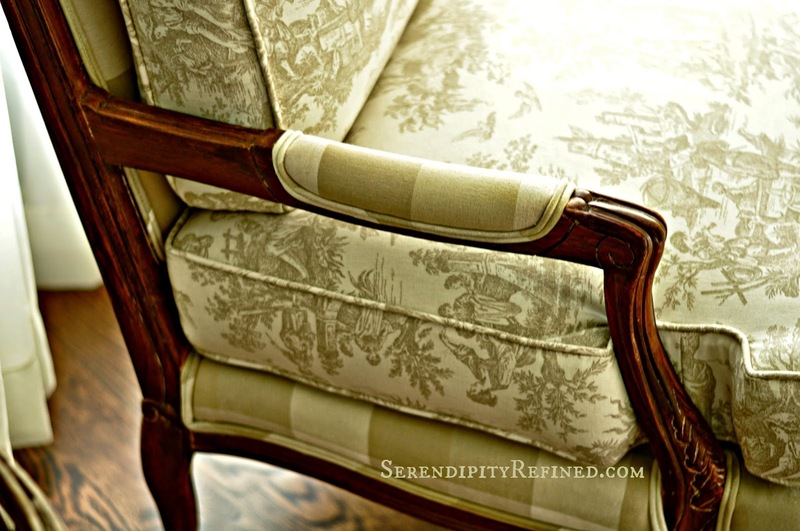 The upoholstered parts of the chair are covered in buffalo check and the cushions are "wearing" French toile. If I ever find the time, I'll probably make some grain sack covers for the cushions...you know how I like to change things up! The chairs are currently sitting in the dining room. It isn't their final home but to be honest, it's the only place in the house where they stand a reasonable chance of staying clean until the hearth room is complete. until then, it's a really great visual, even if it is only in my mind! 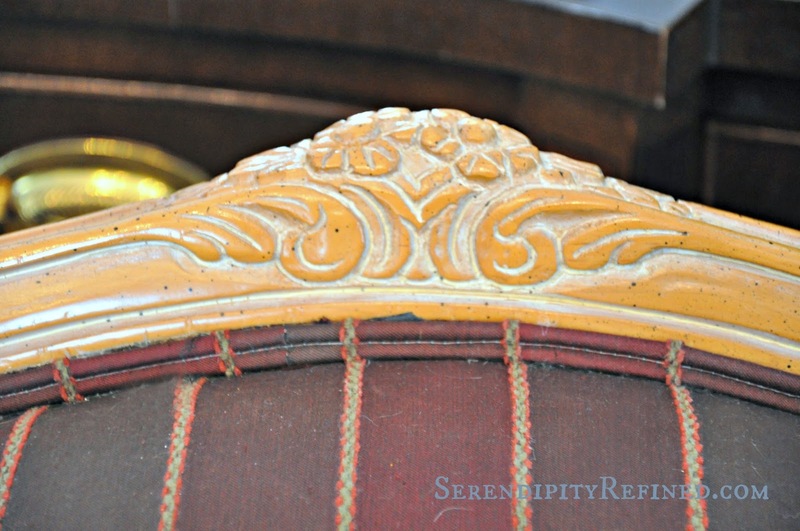 That's how I used MMS milk paint "curio" as a stain to make over my Craigslist French Bergere chairs. I love the way that the darker wood color contrasts with the buffalo check and French toile upholstery fabric. I think that I'll reupoholster my round ottoman to go with them when I have the time. Don't hold your breath, at this rate, it'll probably be November before I can find it have a chance.